Kennebunk Veterinary Hospital - Veterinarian in Kennebunk, ME US :: Why Pet Insurance? Why Trupanion? Quality medical care is expensive. As pet owners, we have the opportunity to budget for the predictable care our pets need, like vaccines and annual exams. But being prepared for the major expense of an accident or illness is much harder. As medical providers, we see the struggle people go through when the care their pet needs is beyond their reach. It is gut wrenching for everyone involved. We believe in pet insurance because a quality policy can take money out of the equation. It allows you to meet your pet's needs and us to practice good medicine. Unfortunately, people tend to think their healthy pets don't need insurance. It usually hits the radar once the first health crisis occurs and the cost of care is overwhelming. At that point, whatever they have wrong becomes a pre-existing condition. So, actually, the sooner you get them insured the better. We've worked with many insurance providers, and we recommend Trupanion. Why? They are a solid company that stands behind their product, they care about pets, their plans are simple and straight forward, and they don't have payout limits or tell us how to practice medicine. They will also pay for treatments and conditions others won't. They reimburse clients in a timely way and, in some cases, can even pay us directly so you don't have to worry about being reimbursed. Take a look at the videos below. The first is from a veterinarian and the second is from pet owners. We encourage you to take a closer look. That's why we've worked with them to offer a 30 day trial of coverage with NO strings attached! Unlike many companies, they offer their product to you completely free of charge for one month just so you can experience it first hand. They don't ask for your credit card, they don't harass you trying to get you to sign up. They believe in their product and want you to try it because they know you'll see the value. Ask us about the trial. You've literally got NOTHING to lose. The video at the bottom of the page is one family's experience showing the power of the 30 day trial (spoiler alert: Happy Ending). We don't receive anything for endorsing them. Except for the knowledge that we will be able to practice quality medicine and our patients will stay happier and healthier. Unlike the medical insurance we're used to, Trupanion plans are simple. They don't pay for preventative care or pre-existing conditions (so getting a plan while your pets are healthy is a good idea). They do pay 90% of the cost of accidents and illness, including many breed specific problems that others won't cover. 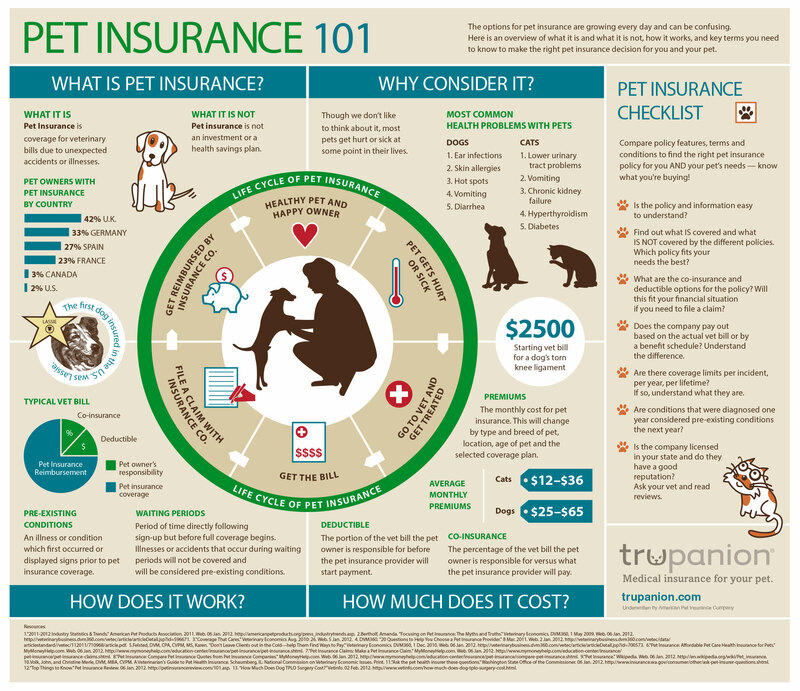 Their website allows you to estimate the cost of a plan for your pet, and has examples of what care costs and what they've covered. Here is an infographic summary.